I tried a new way to enjoy chocolate chips cookies for us. I used Martha Stewart’s thin and crisp cookie recipe , but I used less sugar and added a couple tablespoons of coffee powder ( which you can skip if you don’t like it) and instead of using chocolate chips, I grated some bittersweet chocolate ( because I ran out of chocolate chips haha); you could finely or roughly chop the chocolates, but grating it is so much easier. You could actually use your favorite chocolate chips cookie recipe and just add some water to the dough to make it thinner so it will spread easily once in the oven. 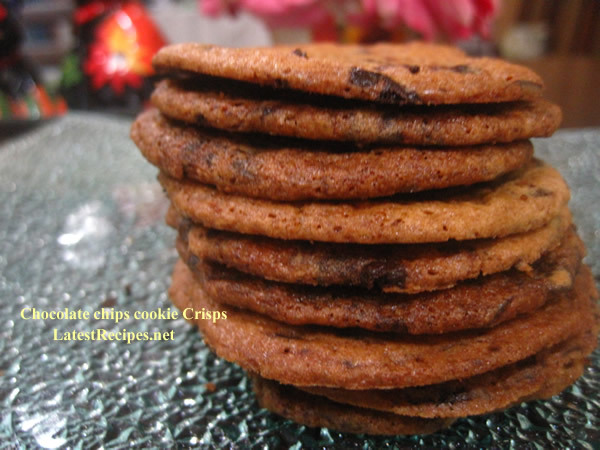 These cookies are so good freshly baked…it’s deliciously thin and crisp as expected although when stored, some of the cookies went soft and crumbled. 🙁 One of the culprits (I read from a baking forum site) could be because I under-bake some of the cookies (as you can see in the photos they are not uniform in color) and when you store them together in a container the moisture from those under-bake cookies make them soft. I need more practice baking this type of cookies; next time I will not bake the whole batch of cookie dough, I’ll just make enough for one sitting, maybe with just a little extra to store to see if it will keep well. Fresh cookies are the best, anyway..whether it’s soft and chewy or thin and crisp. Preheat oven to 350 degrees. In a small bowl, whisk together the flour and baking soda; set aside. In the bowl of an electric mixer fitted with the paddle attachment, combine the butter with both sugars; beat on medium speed until light and fluffy. Reduce speed to low; add the salt, ¼ cup water, vanilla, and eggs. Beat until well mixed, about 1 minute. Add flour mixture; mix until just combined. Stir in the chocolate chips. One Response to "Chocolate Chip Cookie Crisps"
Coffee powder, huh. Now THAT is interesting! !